Michel Echter was educated at the academy in Muncih. He assisted Schnorr in Königsbau. In 1847 he followed Wilhelm Kaulbach to Berlin where he assisted him with the wallpaintings at the Neues Museum. He also worked at the Maximilianeum in Munich where he finished "Ungarnschlacht auf dem Lechfeld 955" in 1860. At the Residenz in Munich he depicted the Nibelungen saga in 30 wall paintings. For king Ludwig II of Bavaria he produced waterpaintings bases on the opera's of Richard Wagner. 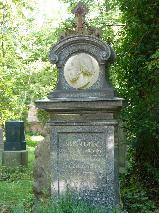 The grave of Michael Echter at the Alte Südfriedhof, München.